Inspiration from Ruby Ranch Horse Rescue. Viking re-homed, Beryl still looking. Some rescue groups prove their point by showing graphic photos of the very worst cases of abuse and neglect. These horrific images cower in a dark corner of my brain forever. Their torture leaves a mark on us, too. Maybe people think that the more blood-dried wounds, protruding bones and dull eyes I see, the more I will care. I wonder how many of us get inspired by the gore, versus the number of us that just shut down. We look away because we are full to the top with pleading eyes and it just rubs salt in the wound, not that the wound was anywhere near healing in the first place. “You can’t save them all!” That’s what my mother said when I was little and it still puts a lump in my throat. What a sorry excuse for inaction. What a petty reason to not even try. Our indifference is our shame, our silence is consent. But really, my name-calling rant doesn’t inspire any more than graphic photos, does it? How can we keep our hearts open and protected at the same time? 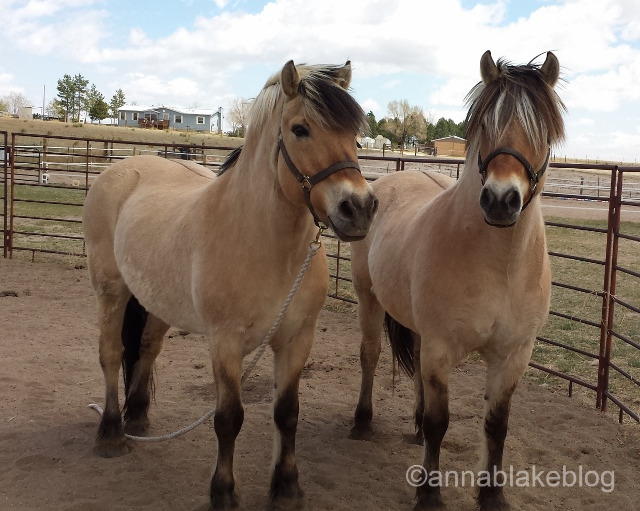 Ruby Ranch Horse Rescue in Ramah, Colorado is celebrating its their 10th anniversary: Ten years of being a voice for horses, rescuing and working with all sides of this dilemma. I can’t imagine what their eyes have seen but one day at a time, they make a difference. The first thing I can tell you is that there is no happy story about how a horse gets to a rescue. Sometimes it’s that skeleton horse who’s been starved, some are distrustful and frightened by abuse and some are just dumbed down by neglect. Some get relinquished because their human is facing impossibility. The grimy, sad details vary and there isn’t always a clear villain. The one thing every rescue horse has in common is that they are there through no fault of their own. The first time I saw Mack… well, you know how thin he was. He was an abandoned elder, used up and left. At first it was touch and go, until he got stronger. Eventually he was shiny and fat -the color of a burnished penny. That’s when he hooked Marcy. She picked him up, her rich laugh clearing the air, and off he went to live with her beautiful mares. Does it get better than that? Yes, it does. Marcy reports that his back has benefited from the chiropractic. Well played, Old Man. You deserve it. Beautiful Cassie, waiting to come home. Misty is a huge success. And it isn’t just her Percheron heft, it’s her heart. Or maybe it’s Becky’s heart, sometimes it’s hard to tell where one of them ends and the other begins. Becky adopted Misty when she was young and un-trained. They’ve worked hard to build their partnership. Becky’s passion is trail riding and Misty has a secret: You can see it plain as day in the arena when she gets the cue –inside leg to outside rein. Relaxed and forward, Misty’s neck arches, there is a soft bend and her shoulders lift. Even in that well-oiled western saddle with the fluorescent orange hunter-beware cantle pack, her secret is hard to hide. Misty is a rescue dressage horse. Pipi was here with me for a couple of months. She’s a mini-mule with a past. She lost her sense of humor after a few homes. She had the audacity (or honesty) to hold a grudge. She softened up some being here. Slower than slow, we negotiated getting the halter on, but whatever happened to her ears, she told me, was very, very bad. You’d have to think a little left-of-normal to like Pipi. Then Julie called. 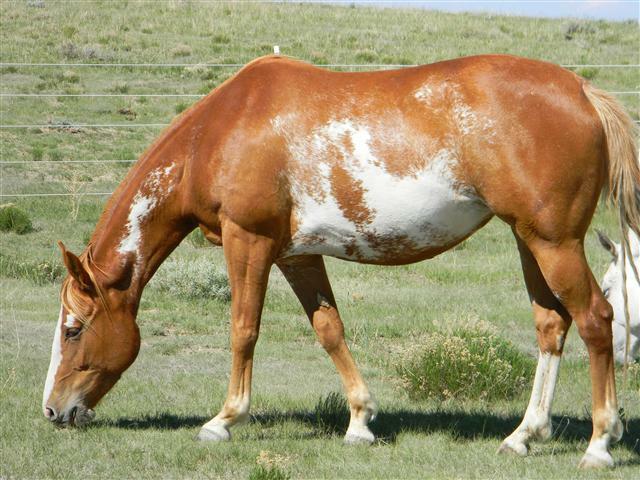 She wanted a companion for her old horse…because her second horse has an inoperable tumor. 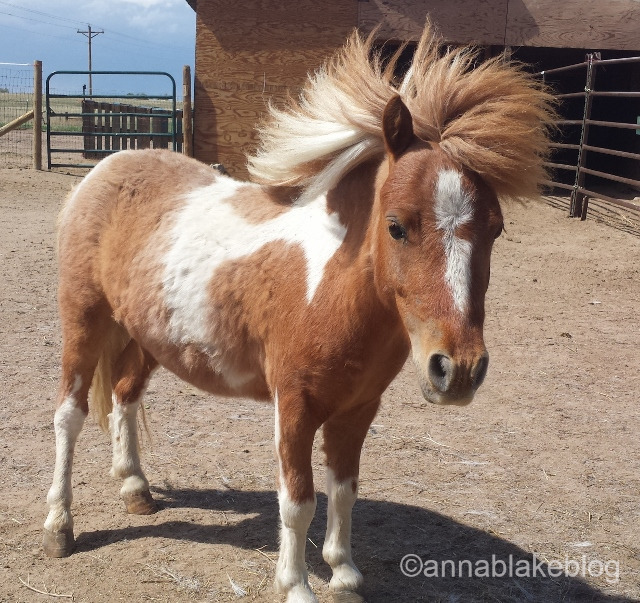 Pipi would need a savvy horse person, so we asked Julie the hard questions. She told us her ailing gelding came 14 years before with missing teeth and a scar on his tongue. She had to go slow, he was still very head shy. We told her the truth, warning that Pipi might be the same kind of challenge. Julie nodded, “I’m good with that.” I watched them together; Julie has good skills, still Pipi doesn’t believe in love at first sight. Some of us are more cautious. But she hopped in the trailer and a week later, we got photos of her grazing with her new family. Her eye was soft, I am glad she’s there to help her geldings. All in all, it’s a hard but fair trade. There really is someone for everyone. That might be the most inspirational thing of all. “If lovin’ you is wrong, I don’t want to be right.” Bhim. I like that sentiment. The truth is I think it’s how all of us should feel; that all horses are our gift of love and responsibility. Maybe it’s naïve to think we can save them all but there’s honor in the effort, and honor in being a caregiver. Maybe we even rescue ourselves a bit in the process. Next Saturday, June 14th, we’re hosting a benefit for Ruby Ranch Horse Rescue. Join us and congratulate Pat, Roger, and everyone at Ruby Ranch for 10 years of exceptional work. If you can’t join us, consider donating. Every life matters, and so does every dollar. Contact Ruby Ranch Horse Rescue here. Thank you. Beautiful, inspiring stories that I would never tire of reading.If only we could “save them all”. But even just one saved is worth it. It is good to hear of the success stories… Ruby Ranch does a GREAT job finding homes. I know we (okay John mostly) are glad to have Miss Mina with us. Just because she and I don’t see eye to eye, I still respect the beautiful and talented horse she is. She takes care of John and that is what is most important to me. We have been fortunate with the rescued horses in our herd, we are thankful to continually learn from them and watch them being horses out in the back yard. If only we had a large fortune to get more land and rescue more 🙂 Thank you Ruby Ranch for your big hearts and hard work, there is truly a place for you in heaven! “….our silence is consent.” That is one powerful statement. Not all humanity is heartless, as this wonderful horsewoman shows through her actions. Please support her and others rescue efforts. What a beautiful and inspirational post. You’re right, the only thing that photos of animal abuse achieve is that some feel pity and others just shut down. Neither helps the animal. Glad to see that there is a different way!